Both Huawei Mate 20 and Mate 20 Pro pack a triple-camera setup with dual-LED flash on their backs. Those four things are packed together into a square, which if the teasers are anything to go by, should become the Mate 20 series' signature shape. 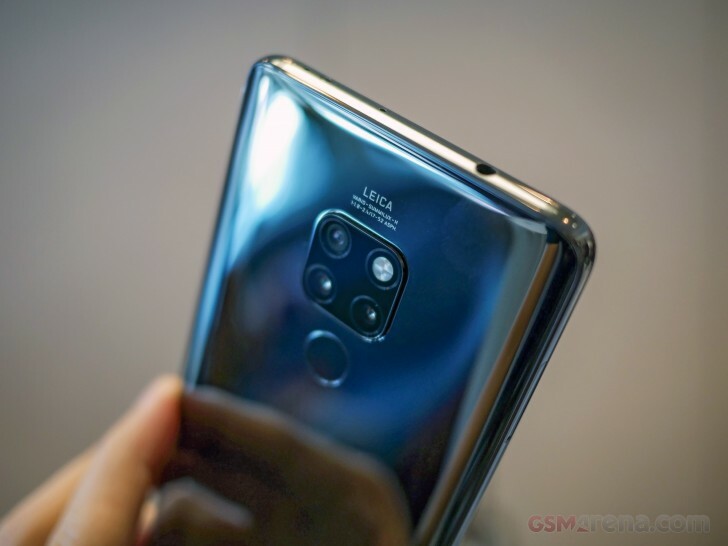 The Mate 20 cameras waves goodbye to the monochrome sensors. Those were very helpful for boosting low-light performance before chipsets could do multi-frame image stacking for noise reduction, but now all they bring is slightly better artsy black and white shots and we can agree Huawei did the right thing by removing them. The setups are still Leica-branded, coming with the exclusive color filters if those happen to be your thing. 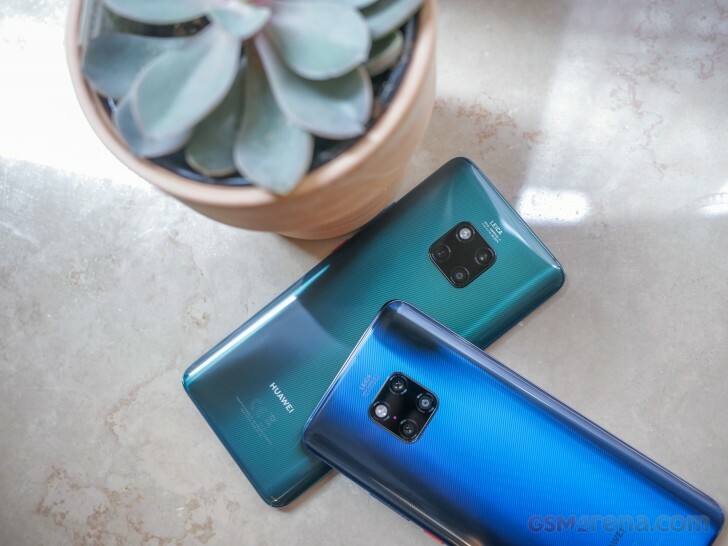 The B&W cameras have been replaced with ultra-wide-angle snappers - a 17mm 16MP for the Mate 20 and a 16mm 20MP for the Mate 20 Pro. Both sensors sit behind f/2.2 lenses. Huawei Mate 20 has a primary 12MP shooter with f/1.8 lens and a secondary 8MP snapper with 52mm f/2.4 lens for telephoto purposes. Both of those lack optical stabilization. Huawei Mate 20 Pro is equipped with the 40MP camera we saw first on the P20 Pro with f/1.8 lens. It spits 10MP photos as the Quad-bayer filter essentially means that's its native resolution, but if you feel like it - you can still opt to save the 40MP image. There is also an 8MP snapper with 80mm f/2.4 long-range lens and optical stabilization - once again lifted from the P20 Pro. Both Mates feature a 24MP f/2.0 camera for selfies at the front and it can do blurred backgrounds. We've seen this unit already on the P20 phones, but sadly its performance wasn't nearly as spectacular as the high pixel count might suggest. 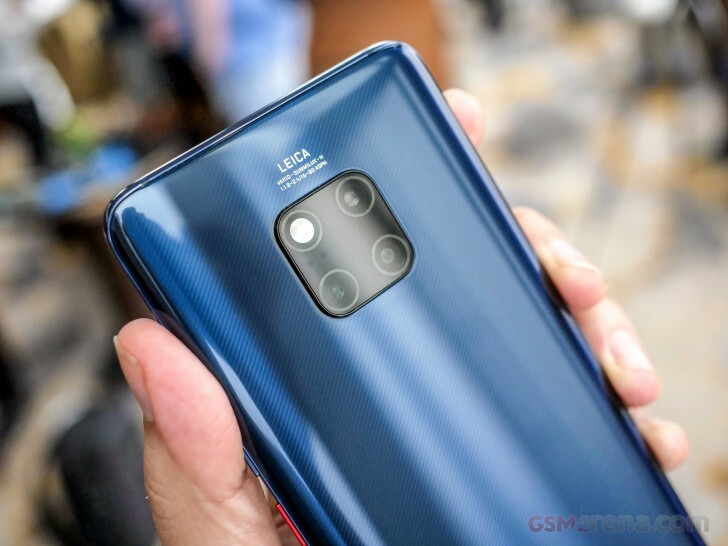 While the Huawei Mate 20 cameras cover just over 3x optical zoom (17-52mm in 35mm equvalent), the Mate 20 Pro goes 5x between its wide telephoto lenses (16-80mm in 35mm terms). The Night Mode is available on both phones and you will be able to take long-exposure-like shots without a tripod. As an added bonus to the wide-angle cameras, Huawei says everyone will be able to shoot some impressive macro shots as it can focus from as close as 2.5cm. The camera app is enhanced by Huawei's AI, of course. There is Master AI 2.0, which can now recognize and tune settings for up to 1,500 different scenes. And we hope Huawei has made it less aggressive on the trees and skies, as the Greenery and Blue Sky modes in the end made Huawei release a new firmware for the P20, where the Master AI is switched off by default. There is also a new AI Cinema mode, which records in 21:9 aspect and uses a Classic Movie color (filter) boosted by the AI itself. And here come a bunch of camera samples from the Mate 20 Pro, so you see the triple setup in action. The light wasn't the best, but the images still came out rather good, impressing with their dynamic range and detail levels. We've even included the hybrid zoom samples (135mm in 35mm equivalent) to show you how those stuck up even if these are hardly the best conditions to rely on digital zoom. We did an impromptu shootout putting the Mate 20 Pro against the Pixel 3, which has a strong claim to the title of best camera of 2018. The Huawei flagship can offer far more in terms of versatility with its ultra wide and telephoto snappers, but even if we look at just the primary snappers it can stand its ground just fine. We also did a low-light shot and the result from the Mate 20 Pro came out quite impressive - see for yourselves. Sadly the selfie samples were once again a big disappointment as the fixed focus snapper is configured so you need to shoot at less than an arm's length to get any sort of decent results. Alongside the two phones, Huawei announced a new Huawei Watch GT. 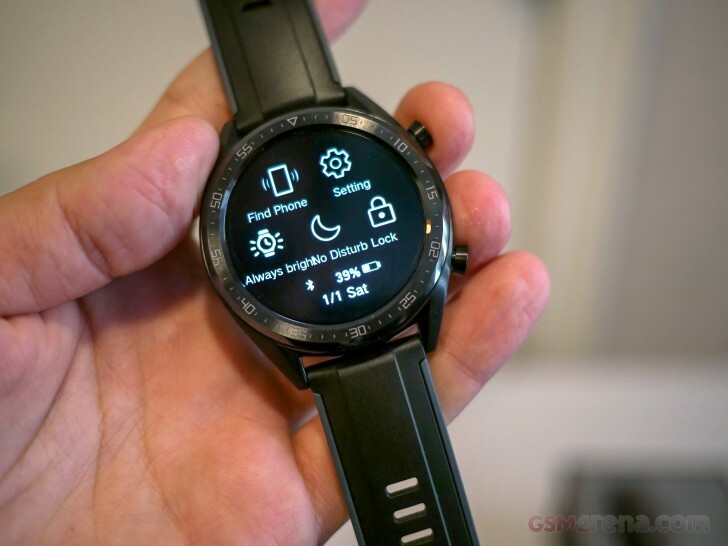 It's actually not a Wear OS device, using Huawei's proprietary latform instead and runs on Huawei's own dual-chip solution. It switches between a low and high-power chip, to get excellent battery life without sacrificing performance. The non-smart platform combined with the dual-chip smart switching, should deliver outstanding battery life. 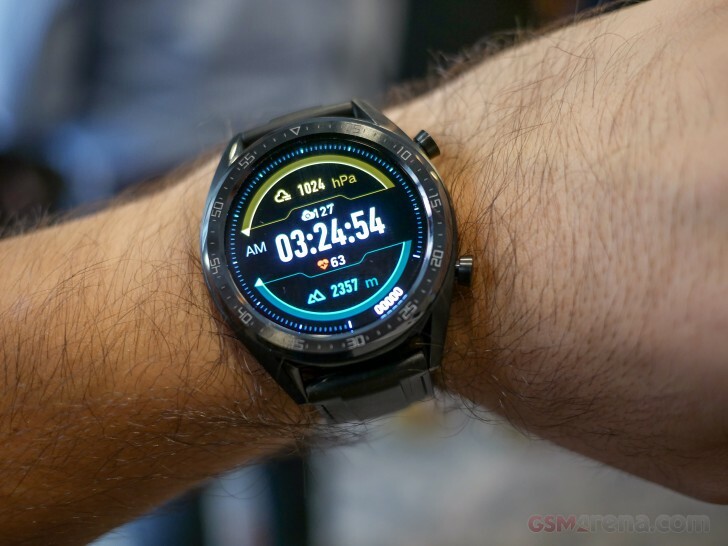 In fact, Huawei says the Watch GT can last two weeks with Heart rate monitoring and exercise tracking for 90 minutes per week. Or, a month with GPS and heart-rate off - if you use it as a watch and for notifications only. The heart-rate monitor is boosted by Huawei Truseen 3.0 HRM technology. The sensor uses 6 LEDs and is more efficient and accurate with self-learning. 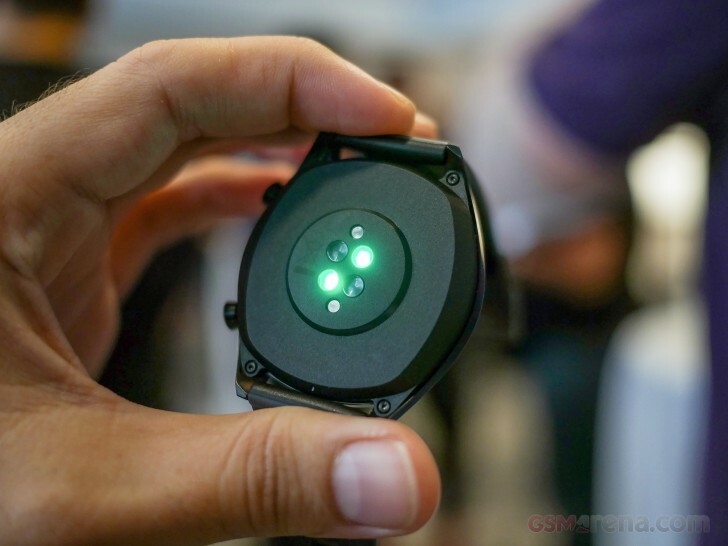 Other key features are GPS, sleep and activity tracking, and an altimeter. With a proprietary platform like that you should not count on getting your favorite wearable apps, though, if you happen to have those. Huawei's event is over, but the Mate 20 duo's journey is only now starting. And if our first impressions are anything to go by, it might be a path to glory. The triple-camera made a big splash earlier this year, but even then, we could feel that the monochrome camera wasn't contributing enough to warrant its presence and we are so glad Huawei made the necessary changes to remain at the forefront of smartphone photography. Huawei has also improved the distribution of the features between the two core Mate 20 phones with the Pro version now only missing on the 3.5mm audio jack and some screen space compared to the regular one. That's still not ideal as there's no way for you to get the full package, but it's not as bad as it was last year.